Welcome to my first installment of Rick’s Cheap Eats. It won’t be the last. 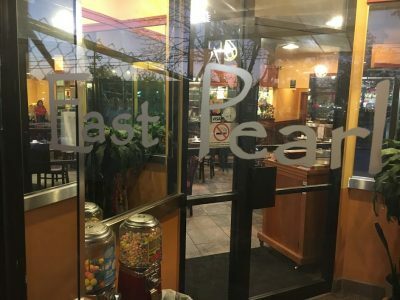 There are a lot of holes left to fill, including Korean, Vietnamese, BBQ, ‘Po boys, and kabobs (see separate posts on pizza and burgers). But these are some of my longtime favorites. What I love about these places is that they do so much with so little. They take humble ingredients and spin them into gold. They’re grounded in peasant cultures around the world where people had to make the most of what they had, relying on cheap, plentiful ingredients, preservation techniques like salting and smoking, and long cooking to render tough cuts of meat and organs edible. 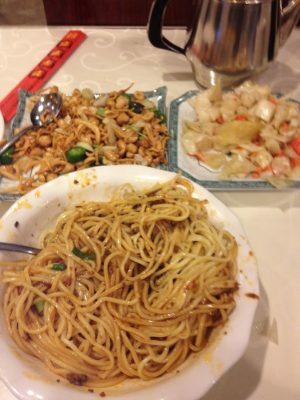 Happily for us, they also figured out how to make it all completely delicious. 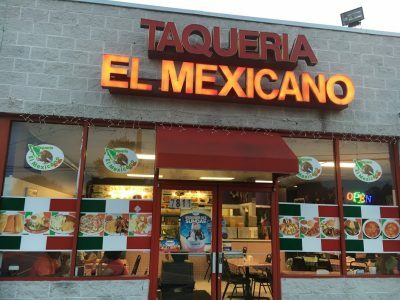 h/t to Todd Kliman for turning me onto this bare-bones taqueria in one of his online chats for Washingtonian. Step up to the counter to order and then grab a seat and wait for the magic to appear. 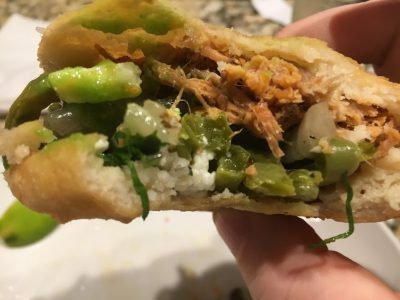 Everything from tacos to tortas are good but the stars of the show are the chicken mole and the pork in adobo. Chicken Mole, $11.95. Beautifully complex, perfectly balanced mole, not too sweet (hello, R&R), not too thick (yes, you, Espita Mezcaleria). Taqueria El Mexicano uses dark meat to hold up to the long cooking time without drying out. 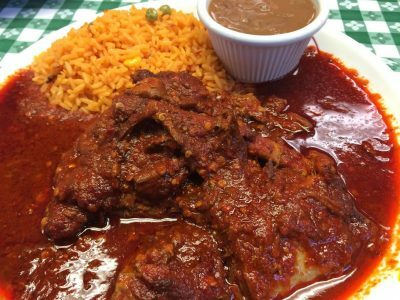 It’s the best mole in town at half the price of many. Pork in Adobo, $11. Fall-apart pork shoulder in a vivid red adobo sauce. 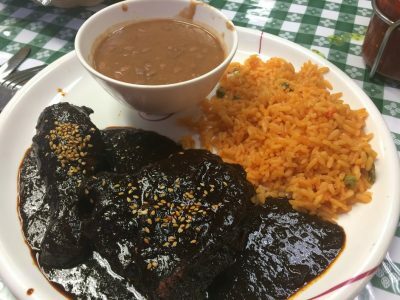 It’s hard to go to Taqueria El Mexicano and order anything but the mole, but the adobo is almost as addictive. 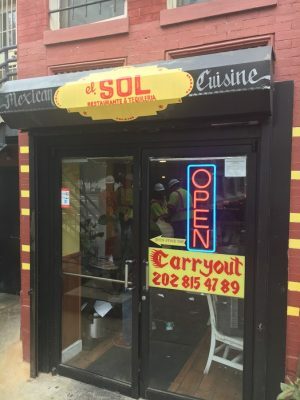 El Sol, 1227 11th St NW, Washington DC. 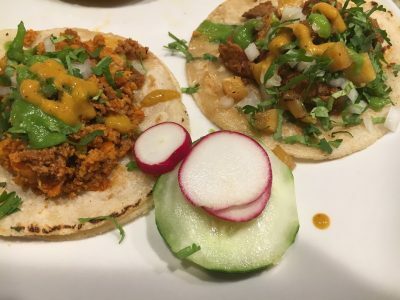 Although it lacks the destination dishes of Taqueria El Mexicano, El Sol does everything well and is a much more convenient lunch spot for those working downtown. Plus, it has table service. 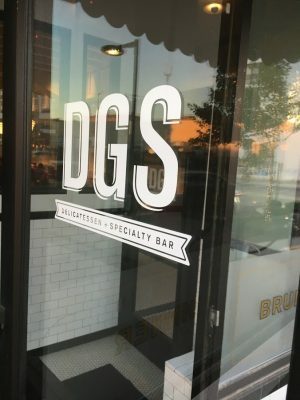 DGS is DC’s best Jewish deli and the only one worth going out of your way for (Parkway, Chutzpah and Attman’s are fine if you’re in the neighborhood). Chopped liver, $9. 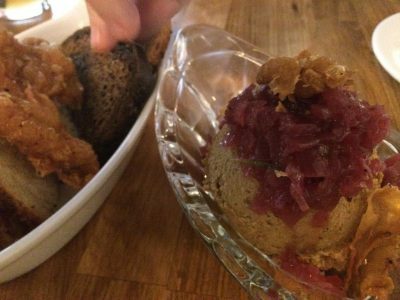 The red onion marmalade, the gribnes (chicken cracklings), the not-too-heavy consistency that afflicts lesser versions. It all works. Matzo ball soup, $7. 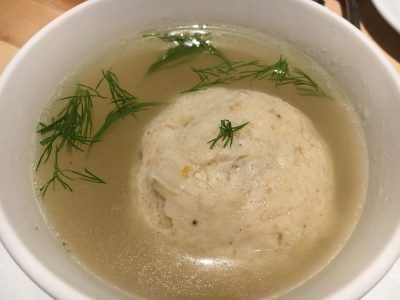 Exemplary matzo ball. Broth could be more chicken-y. Dill is a somewhat odd addition but provides needed flavor to the somewhat wan broth. 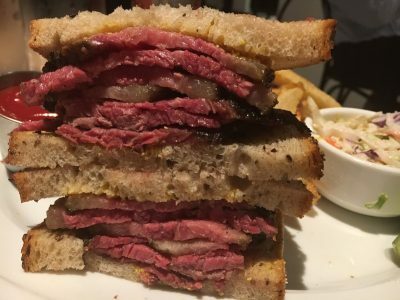 Pastrami sandwich, $15. House made, sliced thick and warm with a good proportion of fat. 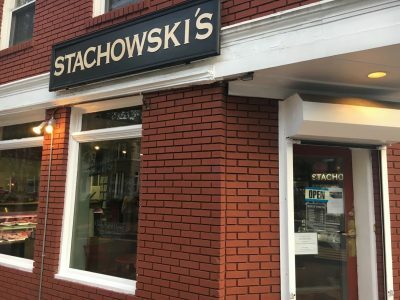 It’s no Katz’s, but in DC it doesn’t have to be. 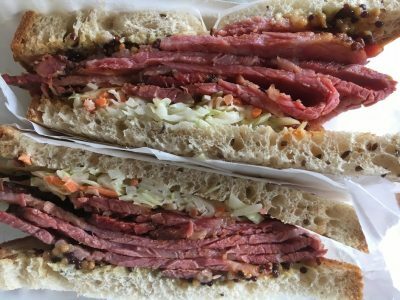 Pastrami with cole slaw and house mustard on rye, $13. Good newcomer, although I’m not crazy about the carving technique. I prefer thick-cut by hand rather than thinly-sliced. 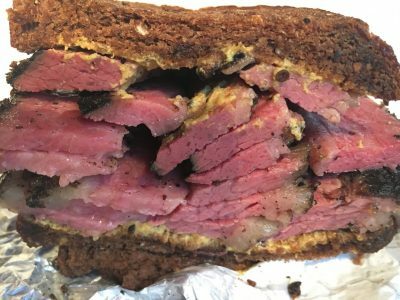 Pastrami sandwich, $14.99. This beast is not for the faint of heart. Thick cut, fatty, mostly tender meat on hearty pumpernickel. I appreciate the generosity but the wall of meat is difficult to eat. I’d gladly take 1/3 less meat for a couple bucks off. 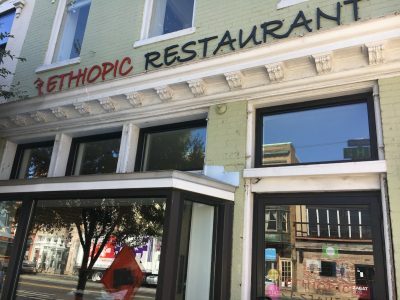 Twenty percent of Ethiopian immigrants to the United States settled in the DC area, making it the largest concentration of Ethiopians outside Africa. 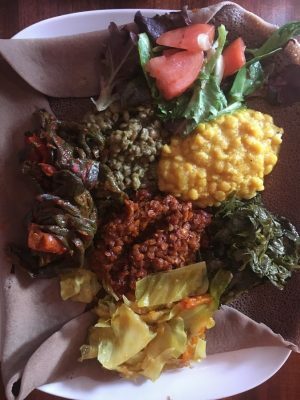 So it’s not surprising that we have an Ethiopian restaurant scene second to none. 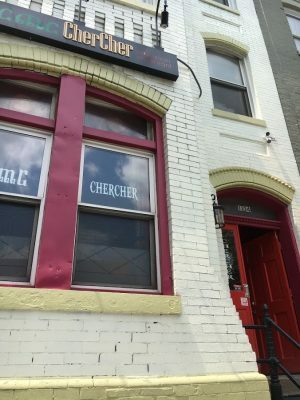 I first tried Chercher because it was closer to my office than the gaggle of Ethiopian spots farther up 9th Street. I’m glad I did. 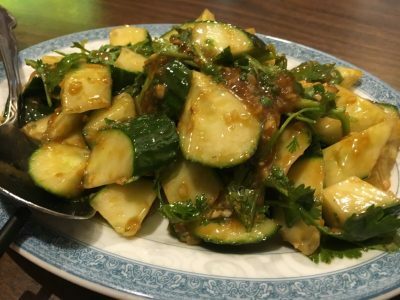 The meats at Chercher are tender and well-cooked, the veggies are fresh and the lentils heartier than most. 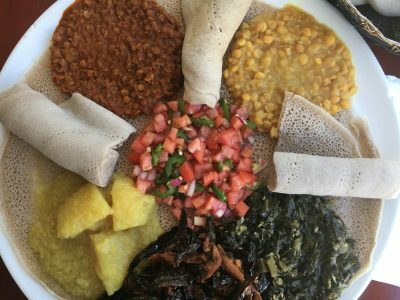 Ethiopic is open for lunch on Fridays, for those who work on the Hill or near Union Station. Vegetarian Sampler, $16. Excellent collard greens. 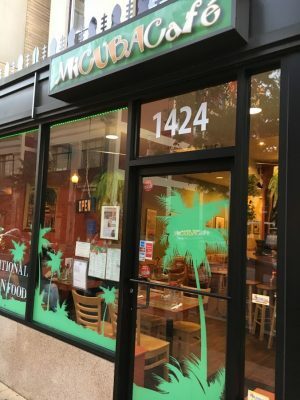 I’ve spent a lot of time in Key West where Cuban restaurants are a vital part of the local cuisine. Mi Cuba is as good as any of them. 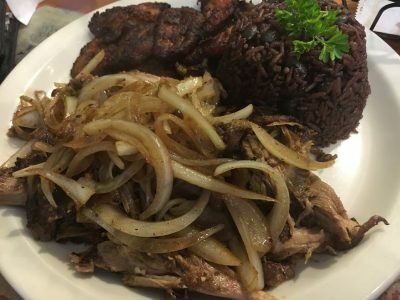 Lechon Asado (Cuban style roast pork) with sweet plantains and congri (rice and black beans), $10.95. 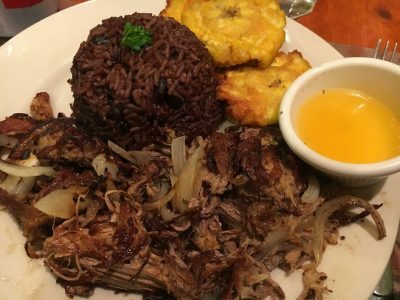 A terrific rendition of classic Cuban roast pork. The surprise hit is the sweet plantains. Often something of an afterthought, here they are deeply caramelized and creamy without being greasy. Vaca Frita (fried shredded beef with onions) with tostones and congri, $12.25. Another winner: long-cooked beef crisped on the flat-top that you can perk up with some sour orange on the side. The tostones are very good but no competition for the sweet plantains. Sandwich Cubano, $9.95. 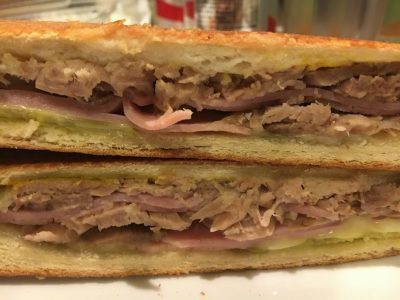 Very respectable Cuban sandwich. 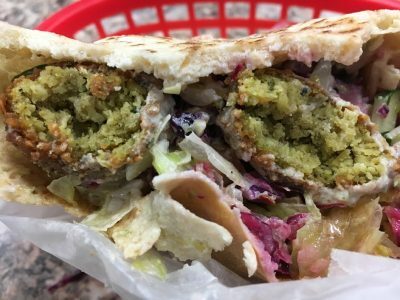 Max’s makes one terrific falafel. 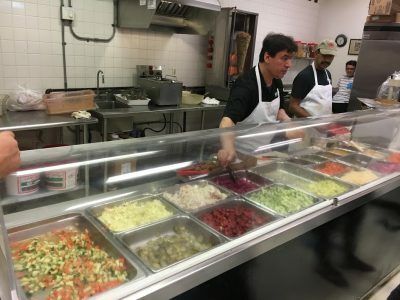 Order at the counter, get a ticket and head over the the falafel stand. Be ready when your time comes to go down the line and tell the guy what veggies you want and whether you want it spicy or mild. 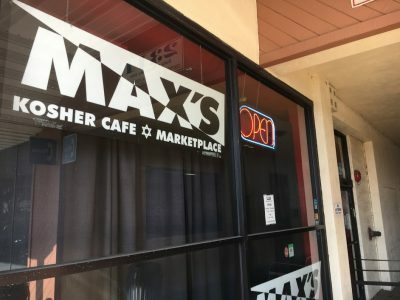 Max’s is one of the few kosher restaurants in the DC area, so it’s a good choice if you or your guests are observant. It also means that it is closed for Shabbat from Friday at 2 pm until 11 am Sunday morning. What’s the most uncompromisingly authentic Chinese restaurant in DC doing in a Days Inn way out here on New York Avenue? According to legend, the Chinese government didn’t trust Americans to build its new embassy so they brought in Chinese workers and housed them at the Days Inn. When the job was finished, the story goes, the chef stayed on and started the restaurant. Apocryphal? Maybe, maybe not. It doesn’t really matter. 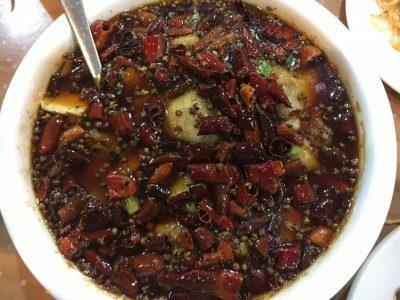 All that matters is that Panda Gourmet is serving up the best tongue-numbing, sweat-inducing Szechuan and Shaanxi food in the District. 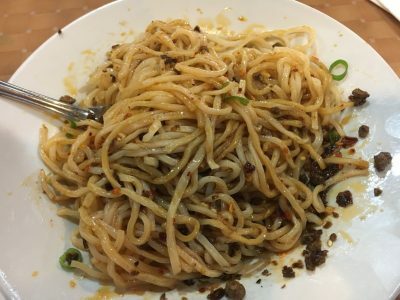 Dan Dan Spicy Noodle with Minced Pork, $5.95. Excellent version. Shaanxi Style Handmade Noodle, $8.95. Delicate handmade noodles, pork belly, veggies, and toasted spices come together beautifully. Tyler Cowen called this a must-order and he’s right. Fish Filet with Silky Tofu in Hot Chili Sauce, $15.95. 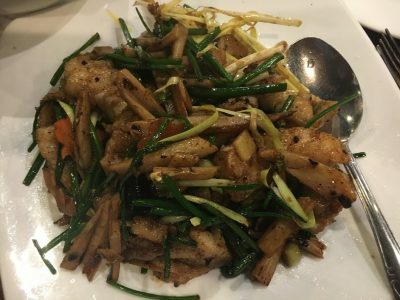 A slick of hot oil and an avalanche of Szechuan peppers somehow don’t completely overwhelm the silky fish and silkier tofu. Don’t let the name confuse you. 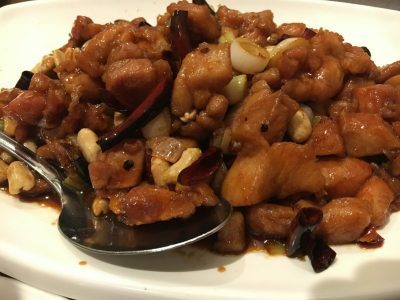 Hong Kong Palace doesn’t specialize in Hong Kong cuisine; it’s Szechuan. 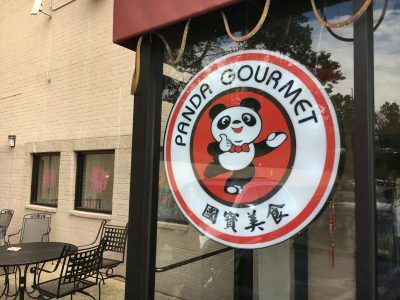 This bustling four-year old eatery on upper Rockville Pike is owned by Sue Li, who formerly owned China Chef in Wheaton. 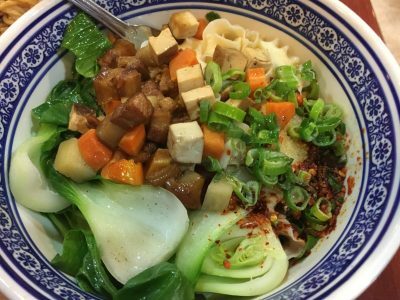 Li’s latest is vastly superior to her earlier effort, putting out soup, roasted meats, noodles and other fare that is both delicate and comforting. 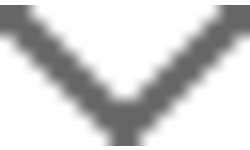 Wonton, H.K. Style & Noodle in Soup with Greens, $8.95. 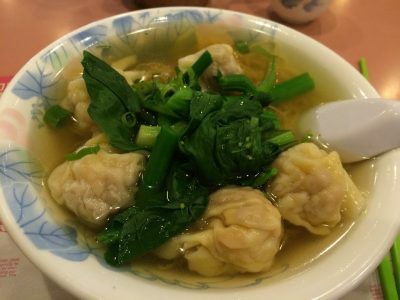 Excellent wonton soup makes a terrific lunch in cold weather. WARNING: Do not order anything on the regular menu. 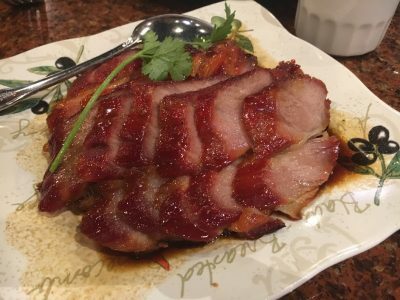 Stick with the wonton/noodle soups and maybe the BBQ meats. 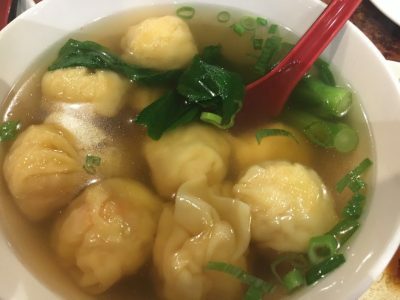 Noodle and dumpling soup with 20-hour broth, $15. 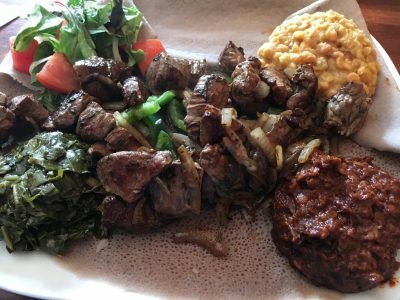 Not exactly Cheap Eats for the portion size, but I include it here in case you find yourself at the Source on someone else’s dime. 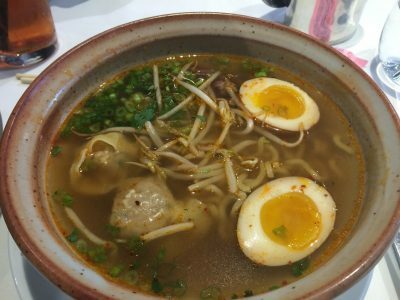 The 20 hours were worth every minute, the deeply-flavored broth, dumplings, soft-cooked eggs and bits of pork make for a delicious bowl. Ready to go for lunch at a dozen of these places. Too bad I don’t live in Washington. Thanks Rick! 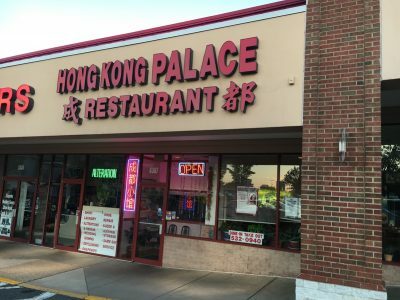 Now I’m jonsesing for Hong Kong Palace ….will have to live for the weekend. At least Taqueria Habenero is just down the street from me – the chorizo tacos washed down with a Mexican Coke is what’s for dinner. And keep on posting. Love, love, love this. Nothing better than chorizo tacos. 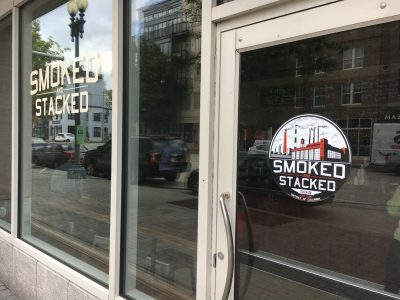 Haven’t had them there but will check it out. Thanks for reading!